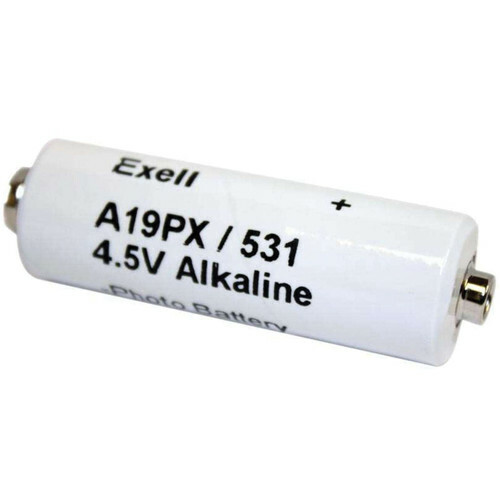 Using this A19PX 4.5V Alkaline Battery from Exell Battery, you can power the vintage Polaroid 100, 101, 102, 220, 225, 230, 240, 250, and 340 cameras. The cell serves as a replacement for the PX19 or 531 battery found in these models. It is assembled in the USA. Box Dimensions (LxWxH) 2.8 x 1.7 x 1.1"
A19PX 4.5V Alkaline Battery is rated 5.0 out of 5 by 4. Rated 5 out of 5 by Anita from Does the job. Worth the expense, as I want to keep my Land camera 340 original and this is preferable to ripping chunks out of the battery compartment. Cost is not that bad when spread over the time it will last. Rated 5 out of 5 by dep from hard to find, but not here. battery for a polaroid camera that hasn't been made in over 50 years. has camera back in action with a quick turnaround on order. Rated 5 out of 5 by George from I would buy this product again This was to replace a battery in an old old meter and just what I was looking for.with the snap on connectors. Rated 5 out of 5 by Anonymous from I would buy this again. It's a battery... It works and its a good price since other dealers wanted to charge me twice as much.